Alcohol content : 40 % Alc. Vol. Appellation : Cognac Grande Champagne, 1st cru of Cognac. Principal grapes : Ugni Blanc, Colombard, Montils. Origin : 100 % Grande Champagne, Méry Melrose organic certified grapes, double-distilled, aged and blended by François Méry. Barrels : Aged in our family cellars in Limousin oak 400 litre barrels in both new and used barrels. Blend : A selection of different barrels which receive their first reduction (the addition of distilled water) soon after distillation. A process which is carried out to each barrel throughout the aging period. 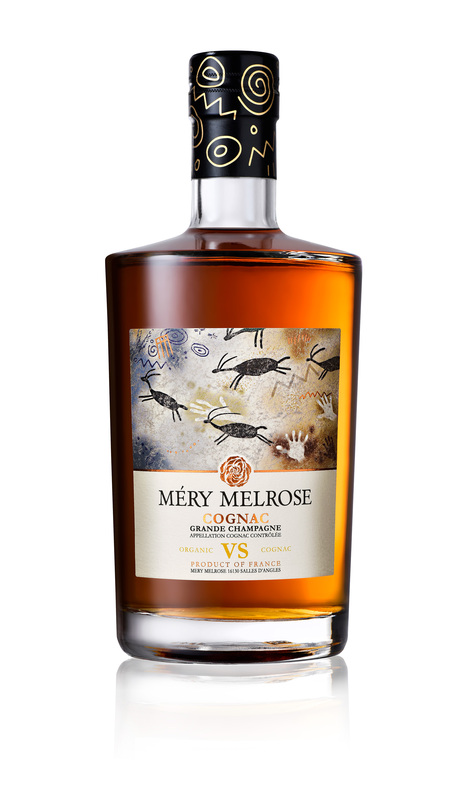 Méry-Melrose VS Cognac, is full of life, having rested in a combination of new and used French oak casks. It glows like honey in the glass, and exhibits a lively, expressive aroma of fresh peach and apricot, mint, violets, and chalk. On the palate, dried fruits and gentle oak spice segue to a refreshing finish characterized by green herbs and the distinct minerality typical of the Grande Champagne region. Relatively dry, it makes an excellent long drink or cocktail, but also shines as a neat pour enjoyed with friends on a sunny afternoon. Pairing : Frozen VS Cognac is perfect to serve with shell fish : langoustine or prawn. Cocktails ideas : Cognac Old Fashioned or Cognac Sour. Medals & Awards : Méry Melrose Organic VS Cognac won the Silver Medal in the San Francisco World Spirits Competition 2017.